The Black-billed Amazon (Amazona agilis), also known as Black-billed Parrot, is an amazon parrot that is endemic to Jamaica and West Indies. Its preferred habitat consists of humid mountainous rainforest, usually limestone rainforest, at middle level of high ground. Due to habitat destruction, poaching forfood and trapping for the pet trade, this parrot - once as common as the Yellow-billed Amazon - has now become rare and endangered. These parrots are seen in small groups or flocks of up to 30 birds where they blend into the canopy of the forest perfectly camouflaged by their green plumage. They are usually detected by their screeching calls during flight. They often form larger flocks with the Yellow-billed Amazon Parrot, usually when foraging. 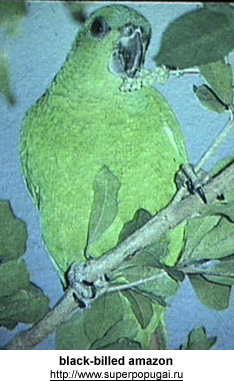 This parrot averages 10 ins (25 cm) in length and is mostly green with small patches of red on the wing and sometimes flecked on the head. The ear-coverts are tinged blackish and the under wing-coverts and undersides of flight feathers are bluish-green. Its feet are grey and the irides (= plural of iris) are dark brown. Its grey bill, with a pale base, makes it easy to separate from most other Amazons, including the Yellow-billed Amazon, which also is a native of Jamaica. Females look like males, except they are generally smaller and have some green feathers to primary wing feathers. Immatures have green primary wing feathers and dark irides (= plural of iris). Newly imported parrots are not known to be hardy and they are susceptible to disease. They require careful acclimatization. During the acclimatization period, they should not be exposed to temperatures below 59°F (15°C). Supplemental heat may need to be provided. These parrots have a calm temperament and become easily trusting with their caretakers. They are medium-noisy to noisy parrots, which needs to be taken into consideration when deciding on the Black-billed Amazon as a pet or for breeding. People who can't tolerate noise, should not consider this parrot as a pet nor for a breeding program. Proximity to neighbors also needs to be considered. Breeding: As this is a rare parrot about which little is known, breeding successes are rare. Outside the breeding season, they are not known to be aggressive towards other birds. However, breeding pairs should be isolated at the beginning of the breeding season, which begins around April. The hen lays 3 to 4 eggs, which she incubates for 26 days. The young fledge when they are about 8 weeks old. Recommended Housing: Their outside flights should be spacious, at a minimum: 12 x 4.5 x 6 ft (4 x 1.5 x 2 m) with adjoining shelter 6 x 4.5 x 6 ft (2 x 1.5 x 2 m). As they are heavy chewers, metal construction is advisable. A good-size roosting / nesting box should be provided from the very beginning of the following approximate dimensions: 10 x 10 x 24 ins (25 x 25 x 60 cm) with entrance hole of 3 ins (8 cm) in diameter.